Why definitions of knowledge and Km should avoid using the word "information"
This blog post is a reprise and a rewrite of one I have posted before, and which always drives comment and discussion, but is worth revisiting for a newer audience. It covers the difference between Knowledge and Information – that perennial topic of debate – and therefore the difference between KM and IM. This debate is often driven by assumptions, those assumptions can influence definitions if you are not careful, and definitions can set the scope of your KM work. It is an open debate how closely knowledge is linked to information, and therefore how valid constructs such as the DIK pyramid are. If you define Knowledge as something based on Information (“knowledge is information plus context”, “Knowledge is information that allows us to take action”, “knowledge is information plus processing”) then you are already making an assumption about the link between the two. This assumption of a link leads to a second assumption that you manage knowledge in the same way as information – through libraries, databases, information bases, knowledge bases, or repositories. that knowledge is more closely related to understanding and to insight than to information. The three assumptions above lead you to a view that the majority of knowledge is carried by people, and lives in heads and in networks, rather than in libraries, databases, information bases, knowledge bases, or repositories. The fact that the relationship between information and knowledge is fuzzy and open to alternative views and assumptions suggests that definitions of knowledge should not be based on information, but should stand alone. That is why (or partly why) the ISO 30401:2018 definition of knowledge is “a human or organizational asset enabling effective decisions and action in context”. No use of the term Information here. If we separate out knowledge from information, then we can also separate Knowledge Management from Information Management. Management of knowledge therefore becomes as much or more about the management of people and their interaction, than it becomes about the management of files and documents. People can interact through documents, and (arguably) documents can carry knowledge, but (as suggested here) Knowledge Management is about the content of the documents – the knowledge held within the documents – and Information Management is about management of the documents themselves (the containers of the knowledge). Unless you assume that knowledge and information are synonymous, then definitions of KM that refer primarily to information are not definitions of knowledge management. As an example, the current default definition that pops up on my Google results for knowledge management is “efficient handling of information and resources within a commercial organization”. This to me is a definition of commercial information (and resource) management, not KM. Similarly the Wikpedia definition “the process of creating, sharing, using and managing the knowledge and information of an organisation” is a definition of “Knowledge and Information Management” (a hybrid discipline some organisations apply). ISO 30401:2018 takes a different approach, defining KM as “Management with regard to knowledge” (where knowledge is defined as above). This neatly focuses the topic, and reminds us that KM is not “the management of knowledge” but “knowledge-focused management” – a crucial difference. In all of this we must remember that the English Language is deficient in this regard, and uses one word for Knowledge while other languages have two. This lack of nuance is at the root of much of the confusion. So if you want to avoid putting assumptions into your definition (always a good thing to avoid! 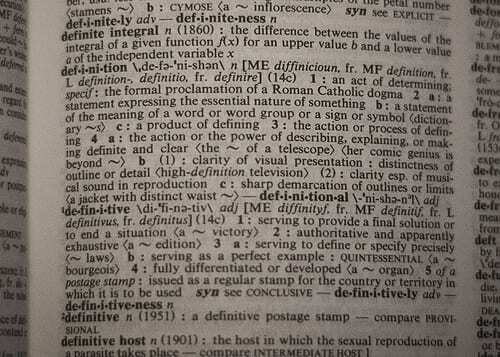 ), then my suggestion is to avoid any definitions of Knowledge which include the word Information. To mix the two is to blur the boundaries between KM and IM, to ignore the 5 main differences between the two, and to risk ending up looking only at the management of documents and online content. Be clear, in order to avoid confusing the disciplines.